Excuse and refuse rhyme, and refuse and excuse rhyme, but excuse does not rhyme with refuse, and refuse does not rhyme with excuse. The story of the composition of the play is that Queen Elizabeth wanted to see another play with John Falstaff, the character from the Henry IV plays. So Shakespeare did some fan service with this play, and banged out a play where the scoundrel pitches woo to two wealthy married women, who see through his game and play with him a bit. Two of Falstaff’s retainers refuse to participate, so he fires them. They reveal to the plot to the women’s husbands, and one of them meets Falstaff under an alias to see if he really is pursuing the women. Falstaff reveals his plans, and the jealous husband tries to catch him in the act, but the merry wives hide Falstaff in humorous ways so they can continue to have their fun leading him on. A subplot deals with the daughter of one of the wives wanting a different match for her husband than either the mother or the father prefers, and her parents’ preferred rivals rival each other. The subplot of this particular play sticks out as a rather grafted on bit that fulfills the requirement of a promised wedding at the end. Also, everyone forgives Falstaff at the very end, which is also stock for the time. The mainline scenes are amusing enough, but it’s the least of the plays I’ve read so far. I hope Queen Elizabeth liked it. You know, the band Poco. Okay, you don’t. But I do. While listening to a Richard Marx song (“Satisfied”) in the car, I mentioned to my beautiful wife that I saw him twice on the tour for his album Repeat Offender: Once at Summerfest in Milwaukee, and once at the old Arena in St. Louis (I won tickets in a radio contest on Y98, and the journey to pick them up is a story in itself). So I told her they did that one song, and the song eluded me. Poco does not get any airplay on the radio these days (but they’re apparently still a going concern). I knew Poco was around in the 1970s, so I wracked my brain trying to think of an Eagles-sounding California country rock song that was big and was Poco’s. But I couldn’t think of it, so I researched. Meanwhile, 30 years in the future, what gets played on the radio? Bands from the 1970s and the 1980s, but only a subset from across the years, so songs like this and many others hide out in the dark corners of our mind. And brightly on YouTube, when we think of them. And, I suppose, at the lesser stages of Summerfest and other fairs throughout the land, but my children do not yet have the patience to listen to the music when there are games, rides, or cotton candy to be begged for. This play is the second in the compendium I have, and reading it, I can see how heavily Shakespeare and Ben Jonson influenced my play The Courtship of Barbara Holt. I see similar structure and situations in the development of the plot in each, but not so much Middle English in mine. At any rate, the title gentlemen are Proteus and Valentine. Valentine is going off to Milan, but Proteus wants to stay in Verona and moon over his girl Julia. His father, though, decides to send him to Milan anyway. In Milan, Valentine is in love with Silvia, the daughter of the Duke. The Duke kind of wants Silvia to marry Thurio, but Silvia is set on Valentine. When Proteus gets to Milan, he is smitten with Silvia himself and proceeds to stab Valentine in the back by ratting out an elopement attempt. So Proteus tries to pitch woo to Silvia, who’s having none of it. Julia comes to Milan disguised as a boy, and when she is heartbroken that Proteus has forgotten her, tries to help Proteus woo Silvia because she wants him to be happy. Valentine, banished from Milan, falls in and becomes leader of a band of outlaws. It’s a great bunch of setup, but we get to Act V, and it suddenly resolves too quickly. Silvia runs away from Milan to find Valentine, and is captured by outlaws. The Duke and his men follow Silvia out into the woods, and they get captured by outlaws. In the very last scene, Valentine, the king of the outlaws, brings everyone together and discovers Proteus’s treachery; Proteus asks for (and receives) forgiveness from Valentine and Julia; the Duke forgives Valentine and allows him to marry his daughter; and allows the banished outlaws to return to Milan. As such, it ends very abruptly. It has a lot going on, good and interesting developments fraught with dramatic and comedic potential, and then Proteus asks forgiveness, and all is forgiven. The end. This might have been Shakespeare’s first play, and as such, it’s a pretty good outing but for the quick end. That’s “Danger! High Voltage” from the album Fire. Here’s the official video for the song, which is a bit racy. You should probably not watch it at work OR IF YOU ARE ACTUALLY IN MIDDLE SCHOOL, SON. I have to be mindful that my children have started to read this blog and strive to keep it family-friendlier than normal. What’s next? Gwar or Steel Panther in a Disney film? I have “Rip It” from the album on my iPod. I used to joke that it was the only Electric Six song without swearing in it, but we can all see now that I exaggerate for humorous effect. Hat tip, sort of, to Kelley of the former Suburban Blight blog, who introduced me to the band via a Facebook post of this very song. The Complete Works of William Shakespeare starts off with this play, one of his more familiar comedies. The book actually runs all of his comedies before all of his tragedies, which might make reading slower in the middle of the book than in the beginning or the end, but time will tell. In it, a deposed ruler of an Italian city-state and his daughter live on a deserted island with only the son of a native witch and some spirits, including Ariel, which is a male spirit in this book (which is hard to remember because of the The Little Mermaid thing). After years, Prospero, the deposed ruler, uses his magic to seperate a fleet and bring his brother (his deposer), the duke of another city-state, and the duke’s son to the island where he hopes to get his revenge. But it’s not a bloody revenge; he just wants justice and his position back. So the new arrivals are separated and they spend time pondering their fates while Prospero plans a little show for them using the fairies and spirits to tell his story. At the end, the duke’s son and Prospero’s daughter fall in love, and their marriage is that that appears in the final act. The play gets its knocks because the current interpreters of fiction can fixate on the slave and link him to American slavery and to blacks, but that’s not really supported in the text. And Shakespeare comedies are more amusing to us now than laugh-out-loud funny, but while a trained reader can recognize the jokes within, they don’t necessarily prompt the laugh response. Unless, perhaps, one is a professor of literature and is steeped in it. For the most part, it hangs together pretty well. The play has some subplots–the romance of the son and daughter, the duke lamenting his lost son, a couple of shipmates who plan with the slave to depose Prospero as ruler of the island–but given the conceit that the people are separated, it works. The subplots fit in. At any rate, that’s what I thought of it. It’s an amusing read, coupled with the umami of it being fine literature that I can be proud of reading (as opposed to the men’s adventure paperbacks, which I only take pride in how many of them I have read which alludes to my high literary pain threshold). I hope you weren’t expecting a more reasoned, thoughtful comment on the play, but I left college a long time ago and don’t have a grade riding on my rehashed novel academic insights. So we do try to get our children to keep a clean and tidy room, and we’re probably a little ahead of the curve on it as they do “clean” the room fairly often (whenever they want video games). But “clean” the room often means to pile things willy nilly into their closet. This weekend, the youngest decided he would clean the closet, so he piled all of the things that had been accumulating in the closet onto the floor of the room. Which overwhelmed them, the poor dears, and they refused to clean and organize the shin-deep collection of mixed-and-matched kid-a-brac. Worse, when told to clean their room, they defied the directive for a couple of days, which caused my beautiful wife to go all Draco on them, levying a punishment of 1 week of grounding from electronics per day until the room was clean. Well, I knew that an abstract number of weeks stretching into the future wouldn’t motivate them. They cannot conceptualize being grounded from electronics until summer. Heck, even I cannot conceptualize eating healthy for a month on the Whole30® diet, and I’m 25 days through it. Also, I cannot remember what a doughnut tastes like, but I seem to recall it was really, really good. Sorry, I was daydreaming there for a minute about carbohydrates. After a couple of days, my wife bought boxes for the boys and told them to just take the stuff on the floor and to put it in the boxes, and we would store it away. Put all of it in the boxes. But the boys did not do such a thing in a timely fashion. As their archeological digs hit different strata of clutter, they discovered things that had been in their closet for months. Fun and interesting things that they must play with right now. So the room was not clean for days. Bedtime is 8pm until the room is clean. No sweets or desserts until the room is clean. All “Can I…?” questions are “No.” until the room is clean. No snacks after dinner until the room is clean. None of these worked, as the children racked up sanction upon sanction until…. No sweet cereals for breakfast until the room is clean. 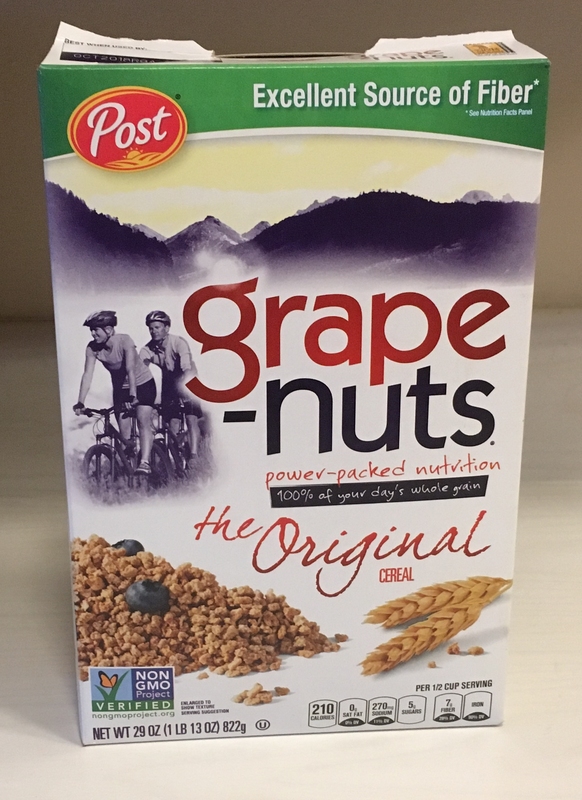 So I bought it, and I put it on the counter, and I explained to the boys that it was neither grape nor nuts and that they could not put fruit in it like you see on the box. I also bought some Fiber One, which I explained was like the pellets you feed to goats at the petting zoo, but in milk. Today, the room is clean. “So I guess we’re eating some Grape-Nuts,” my beautiful wife said. You know what I mean. Steven Tyler of Aerosmith cut a country album. Jewel cut a country album. The trend was so prevalent that Alan Jackson wrote a song (Gone Country). But it’s not a recent thing. Dean Martin did it before it was cool, and when Dean Martin did it, it became cool. 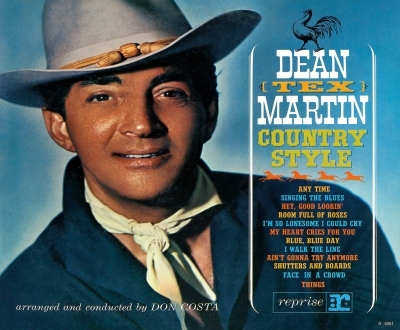 To be honest, not among my favorite Dean Martin discs. Strangely, “favorite” does align with “the first record I got by” as it often does. When my children ask me what I do for a living, I find it hard to explain what a software testing and quality assurance professional is. They still don’t know, but they do know that what I do keeps me from entering the cool contests that our friends keep winning. Because I’m not allowed to enter because I work there, but the friends can, and they win. True story: Friends of mine have won thousands of dollars in prizes in contests for a company I’ve worked for. So much that the company’s owner wondered if I was somehow scamming him. Since I still work there, he must have believed my protestations of innocence, but there have been no more contests, which has severely limited my friends’ collection of valuable comic books. The Springfield News-Leader made sure to post someone at Wilson’s Creek National Battlefield to capture the chagrin of people who would find the GOVERNMENT SHUT DOWN! PEOPLE WILL DIE, OR NOT GET TO USE THE BATHROOMS IN THE VISITOR’S CENTER! Three visitors from Michigan spent a cold afternoon battling whipping wind and a government shutdown in their attempt to see Wilson’s Creek National Battlefield. The historic Civil War national park southeast of Republic was nearly empty of visitors Monday afternoon, and no park staff was visible during the short-lived government shutdown. The popular visitors center was closed, but motorists could still drive through the park property, read the educational signs and listen to recorded bits of history about the first Civil War battle west of the Mississippi in 1861. In other words, it was about as busy as you could expect on a cold Monday afternoon. All three, however, laid the primary blame on President Donald Trump. It’s a shame how many people don’t know that the President signs the bills and the legislature passes or does not pass them. I used to give journalists the benefit of the mendacity when they’d write stories mischaracterizing the political process in this country, but now I’m pretty sure they’re just ignorant, too. As you know, I just bought this book a couple weeks ago. As it so often happens in the Nogglestead library, I pick up the most recent book I bought to read, and things like The Buddhist Tradition in China languish on my shelves for decades. 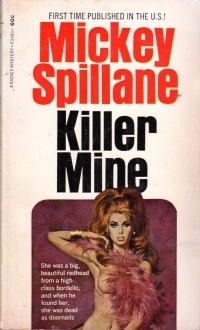 I started reading Mike Hammer books in high school, probably spurred by the Stacy Keach television portrayal (and the fact that I read detective novels a lot in high school), but I haven’t seen many Mickey Spillane books at book sales in the past couple of decades, so my reading of them are pretty sparse since the dawn of the new century (see Black Alley, a Mike Hammer novel, in 2003 and Dead Street, a non-Mike Hammer novel completed by Max Allan Collins, that I read last year). Like More Good Old Stuff, this book is old school hard-boiled stuff. The book is from the middle 1960s, but it reads like 40s fiction. “Killer Mine” deals with a cop returning to his old, rough neighborhood where some of the local hoods he grew up with are getting bumped off. The brass put him in undercover, placing him as the pretend wooer of a policewoman who still lives in the neighborhood. As he does some legwork and starts to win over the population who distrust police, he closes in on the killer. Who was obvious to a modern, sophisticated reader of detective fiction. As a matter of fact, I wondered how the detective would take 150 pages to discover what I knew from very early. Then, on page 75, he confronts the killer, and I thought, “Whoa! Now there is some twist to account for the other half of the book!” But, no, this single volume is two novellas. The second, “Man Alone”, I had read before. I don’t remember much except they call the protagonist “The Killer Cop.” A cop beats a framed payoff from an organized crime figure and then the murder of the organized crime figure and sets out to find who framed him. Again, the answer is obvious to modern readers who’ve been dealing with these sorts of twists for decades after this was written. But we’re not in a Mickey Spillane book for a novel twist at this point. Instead, we’re in it for the gritty, hardboiled writing style, which you get here for sure, but as I have grown older, I find it less compelling than, say, John D. MacDonald or Raymond Chandler–or even Ross MacDonald. It’s certainly above most men’s paperback fiction in consistency and punchiness, but not the top tier. Which, I’m sure, Spillane would have accepted as long as people bought his books. So I had fifteen minutes to kill yesterday afternoon before picking up my children from school, so I stopped in at Hooked on Books. Partly because it has a restroom. But, as you know, I always find something on their sale book racks. Today, they were indoors because of the weather. But I found a couple. I might have mentioned before that Hooked on Books has the best selection of John D. MacDonald paperbacks in the Midwest. But that was eleven years ago. Now, they have two paper copies of Barrier Island, and I have a lifetime of regret that I did not pick them up when I could. At any rate, I got a couple sale books. Hardball: Aryan Legion, the second volume in a paperback series I’d never heard of. I am pretty sure the Aryan Legion are the bad guys here, and this is not further evidence that this is a Nazi-sympathizing blog. Although linking to it with the hyperlink text “Nazi-sympathizing blog” is probably not helping my case with the search algorithms. Wheland and Carwin the Biloquist by Charles Brockden Brown. I recognized the Penguin Classics spine but never heard of the book. I wonder if it’s really a classic, or just something that modern English professors want to include on their syllabi. I guess I’ll find out someday. A Question of Accuracy, something in a series called Exploring Mathematics. It might be a children’s book, but if it’s a children’s book from sixty or seventy years ago, it will be something to challenge modern adults. Proud to be Right, a collection of conservative voices of the next generation. Which might be two generations ago by the speed of Internet intellectual fads. The Backward Shadow by Lynne Reid Banks, which is a sequel to the novel The L Shaped Room. Which I had seen recently, so I thought I had it on my shelves. Further reflection indicates that this book was one I bought in my eBay selling days, and that I still have a picture of it from the same that I use as test data from time to time on one of my contracts. So I’ve seen the book cover, but I no longer own the book. But I just bought the sequel. 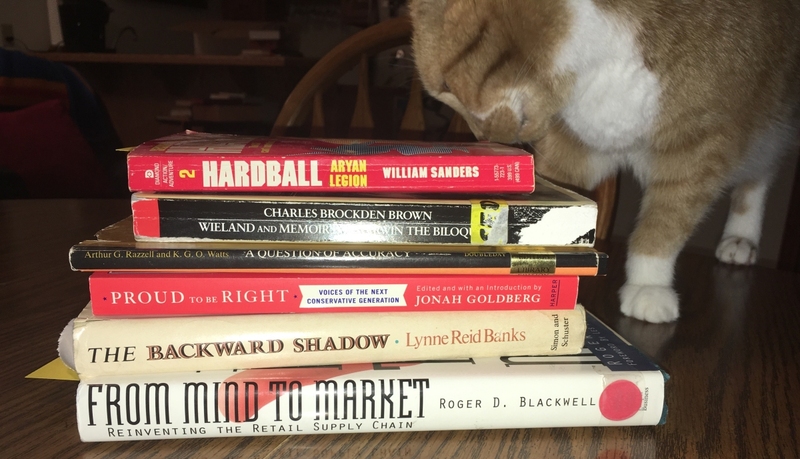 From Mind to Market by Roger D. Blackwell. It’s a book about rethinking logistics. I like to buy industry-specific books sometimes, but apparently I like to read them less. The guy behind the counter couldn’t find the discounted price on it, so he asked me to verify that it was a sale book. I pointed out that it had a red dot on the spine, and he said they’d never done that. But the young man has only been there three years. I’ve been coming to Hooked on Books for over 20 years (!) since my beautiful wife and I were but dating. The kid behind the counter was probably even born then. They were sale books, so I spent about $7.50. It’s almost worth it for the story about the last book alone. Is it time for radio stations to alter their play lists already? Apparently so, for the “rock” stations in Springfield have changed their formats to chase the local “Jack” station. So 106 “The River” in Springfield, the local “Jack” station, or whatever they call the variety format that plays a couple dozen hits from the 80s, a couple dozen hits from the 90s, and six or ten songs from after the turn of the century, has shifted its playlist to include Led Zepplin and AC/DC. So 104 “The Cave,” a classic hits (what we used to call Album Oriented Rock back in the day) determined it needed to compete with that format by playing M0AR POWER BALLADS. The rock station that played new hard rock and metal, Q102, decided what it needed was alternative music from the 1990s. Friends, most of the rock music from the 1990s sucked. Sorry, but you know it’s true. Grunge corrupted everything it touched, and emogoth really loud is not rock. US 97, which touts its long-standing rock heritage and pedigree dating all the way back to the Clinton administration, has added some newer songs but has also added more 90s rock and power ballads. I mean, I heard Green Day’s “Basket Case” twice yesterday, on two different radio stations. And by that I mean I heard the first two lines (“Do you have the time/to listen to me whine?”) before changing the radio station. Attention, millennial radio program directors: THIS IS NOT ROCK. I used to be Green Day agnostic. But a couple more spins of this in the near term, and I’ll hate Green Day. Which leaves poor Brian J. with nowhere to turn to hear new rock. What, YouTube? I’m an adult. I don’t have time to wander around YouTube. Spotify? Meh. Make a radio station on one of your favorite bands, and it will play you songs from four or five other bands. Which will be the same bands pretty much no matter what I pick. I miss the good old radio days of 2017. So the other day, I’m making hash browns and cottage fries for breakfast, so I pull out my beautiful wife’s expensive Scanpan skillet which I’ve never used before because I’m afraid of expensive things. So I finish cooking the potatoes at a high heat, and I grab the handle to pour the hashbrowns into a bowl, and…. What freaking idiot thought it would be a good idea to put a metal oval with the brand name right in the handle where you’re going to grab the pan? Don’t they teach the kids in design school that metal conducts heat? 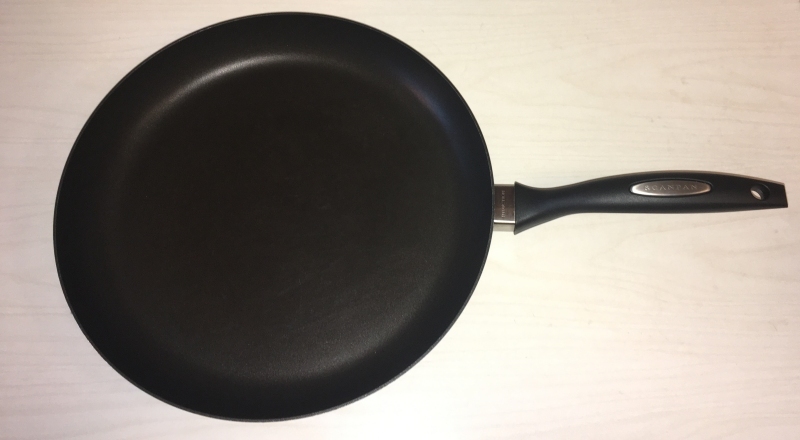 It rather makes including a plastic or rubber handle on the pan rather superfluous since the insulating properties are quite rendered useless in that particular area in the middle of the handle where your hand goes. Unless… the goal is free advertising? 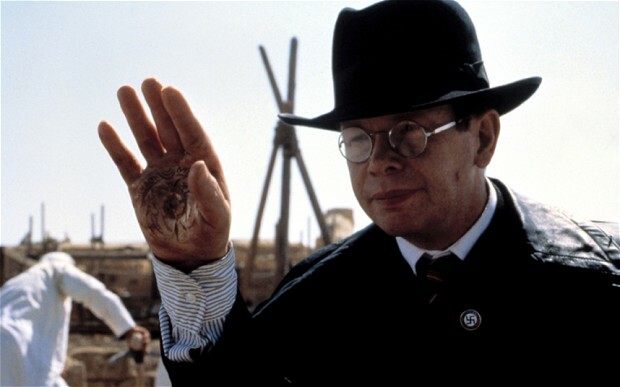 Oh, my God, I’ve just made this a Nazi-sympathizing / racist blog by including a picture of a man giving a Nazi salute. Even though it’s a fictional Nazi illustrating an attempt at humor. What have I done? Never mind. The important life lesson here is Fear expensive things. They hurt you. 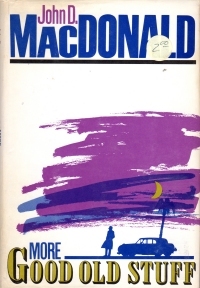 This is the second big collection of MacDonald’s pulp-era short stories. I’ve read the first, I think, sometime in the distant past. I thought I read it in the recent past, but I was thinking of End of the Tiger, which I read in 2015. Unlike that collection, this one is a collection of pulpy crime stories that appeared in various magazines in the 1940s and 1950s. MacDonald says in his forward that he’s updated them a bit to make them more contemporary (to 1984). However, by now, they’re quite dated, but less so to someone who was sentient in 1984. “Deadly Damsel”, a story about a woman who kills husbands, and what happens when she meets a grifter in Florida. “State Police Report That…”, wherein an escaped convict is tripped up by a surprising twist. “Death for Sale”, wherein a prisoner of World War II hunts a French traitor to New Orleans. “A Corpse In His Dreams”, a successful investigative journalist returns to his hometown, haunted by the death of his girlfriend in a car accident he survived. “I Accuse Myself”, a man recovering from emergency brain surgery remembers the murder. “A Place to Live”, a city employee takes on the city machine with a story of corruption and finds the odds stacked against him. “Neighborly Interest”, a trio of kidnappers hide out in a nondescript house and are tripped up by a small detail. “The Night Is Over”, a grieving man hits bottom and is unwittingly enticed into a scheme by a con man and blackmailer, only to find himself trapped. “Secret Stain”, a hard man plays both ends of an organized crime group against each other for his own reasons. “Even Up the Odds”, a drunkard gets into a scrap with the local connected bully. “Verdict”, a hard man is sent out of town to eliminate a crusading police chief but finds more than he expected. “The High Gray Walls of Hate”, an ex-con looks to even the score with those who framed him. “Unmarried Widow”, a woman finds an out-of-work journalist in a bar, and mistakes him for someone named Jerry. The journalist finds that some hard men are after her, and he tries to find out why. The gimmick where a mad woman calls the protagonist by another name, you might remember, was used in the film Quigly Down Under. I did. “You Remember Jeanie”, a former cop hits bottom after his girl is killed in a bar, and he continues to frequent the bar for vengeance. Overall, a pleasing book to read, and it’s the first book I’ve read this year (!). I might revisit the MacDonald stuff for fun some day, especially if I get to live to 200 and they stop making paper books so I have to reread what I have. You know how people like to claim that, if their parents had not thrown out their childhood toys/comics/baseball cards, they’d be rich? Yeah, as I’ve proven time and time again, that’s not true. I still have all my baseball cards and comic books from those days, and they have not appreciated much if at all. Most of the comics I own retail for less than the cover price these days, okay? Another thing my mother did not throw away (among the everything my mother did not throw away): My old G.I. Joes. Now, my collection began in like 1983 when my father’s then-girlfriend tried to curry my (and my brother’s) favor by buying us toys–and I got my first G.I. Joe, Flash. This was not the big G.I. Joes, but the four inch figures. But my first three (Flash, Snake Eyes, Rock and Roll) predated the swivel-arm grip, so early eighties through the middle 1980s. As I a bunch of comic books last year, the lot included a bunch of G.I. Joe comics, and I could follow along with the introduction (and my acquisition of) the action figures as they were added to the comic book. The heyday of my collection must have been between 1983/1984 and, what, 1987? In retrospect, it was a blink of an eye, but my brother and I gathered a bunch of them. We even got some mail-away items that you got if you sent a couple of proofs of purchases and a couple of bucks to Hasbro, including the hooded Cobra Commander and a windsurfing board. The growing collection moved with us from Milwaukee to Saint Charles to the trailer park in Missouri. Did we play with them when we were in high school and lived in the valley? I don’t think so. I remember playing with them in the trailer, though, and envying some of the kid across the street’s collection. My mother kept that collection in her basement in an old toy box.l At some point, I retook custody of it. The toy box, a cheap thing clapped together of particle board, disintegrated, so I put it in a translucent bin. Which has been in the Nogglestead garage for nine years (?!). And for a long time, my boys could see them, but I would not let them play with them. Why? A sense of possessiveness? Perhaps. I am particular about my personal relics, and my children are, well, boys who are a little rough with things. Also, I figured that cleaning up and assembling the various pieces would be a little time consuming. But I recognized that the time window of my children’s interest is closing, so since the boys had a holiday on Monday, I brought the bin in. I was right about the undertaking: it took me about two and a half hours to wash the items (with a toothbrush at times!) 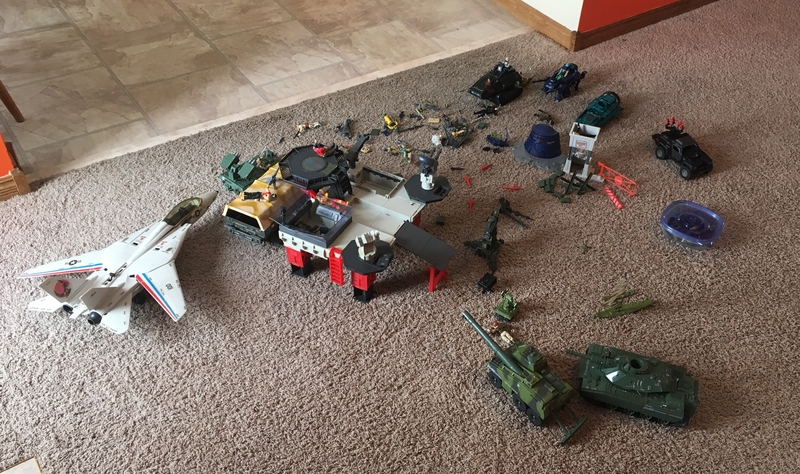 Most of the pieces were here, and only a couple of things were broken (which made me want to seek out my brother and get into a fist fight because undoubtedly HE BROKE IT!). The washing itself was a bit of nostalgic deja vu–when the boys were two and four years old, I’d sometimes pull all of their toys into the kitchen and wash them because they put everything in their mouths at that age. So, on a snowy day, while my boys played in the living room, I washed toys, and was taken back to that. At any rate, they started playing with the toys as soon as I washed the individual pieces, and they loved it. They’ve got a snow day today, so they’re playing with them again. The Transportable Tactical Battle Platform. Mobat (one of the reasons I can tell the difference between a tank and mobile artillery). Bazooka (to be honest, I’m surprised I have this figure; it must have been a late addition to the collection, as it’s in very good shape). A couple of the action figures had broken bands, which means I’m going to be reviewing on YouTube how to fix them and ordering parts from Amazon sometime. At any rate, a bit of my boyhood I finally shared with my boys. And they’ve only broken one thing so far. Which I’m going to blame on my brother and have to fight him over in one of those sibling fights that is mostly wrestling until we get tired, and then we’re friends again. You know how you give notice at your job, and suddenly to do things you wouldn’t do if you wanted to keep that job? Skip this, though, if you’re a contractor or otherwise plan to seek work from that company in the future. I’m pretty sure I’ve never been this way. 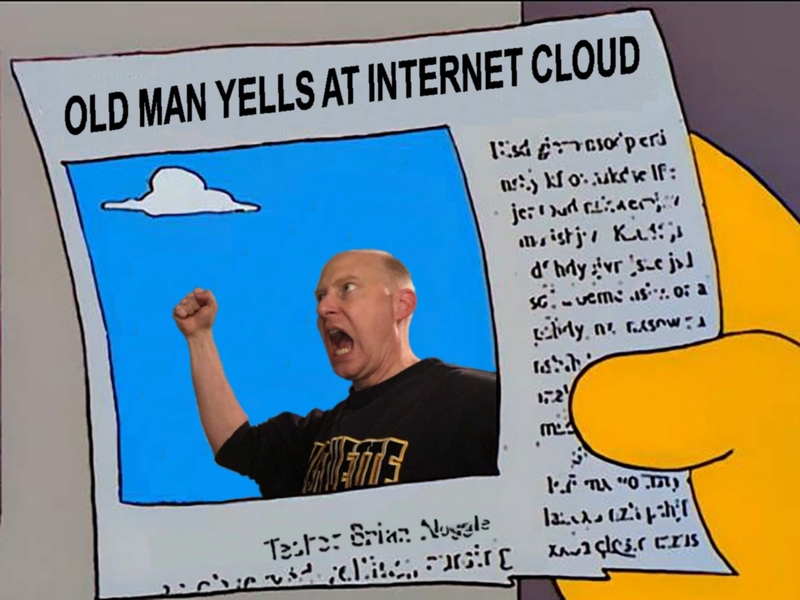 I just wanted to invent something on the Internet. You know the other quote Edward Bulwer-Lyton is known for? The latter has spawned annual writing contest.